From it’s extraction and processing at the refinery, to tank or truck transfers, or to the maintenance on small twenty pound storage cylinders, a small amount of saleable vapor either escapes or is, by necessity, burned off into the atmosphere. When receiving delivery of the product from a large tank such as a 33,000-gallon rail car, the end-user may be expecting to receive close to 30,000 gallons, for example. 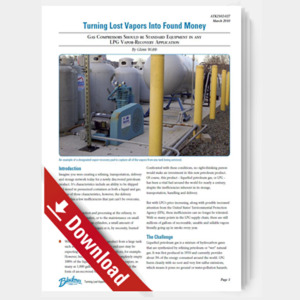 However, because pumps are unable to completely empty 100% of the liquid from the tank or remove vapors, as many as 1,000 gallons of liquid are left behind in the form of un-recovered vapors. Confronted with these conditions, no right-thinking person would make an investment in this new petroleum product. Of course, this product – liquefied petroleum gas, or LPG –has been a vital fuel around the world for nearly a century, despite the inefficiencies inherent in its storage, transportation, handling and delivery.